Win a Year of Free Maintenance! Those VCRs collecting dust around your office are so 20th century — and we know you've been dying to upgrade. So we've created a cost-effective means for you to update your media-monitoring technology, and we're offering you a chance to win an extra 12 months of free service to boot. How? Just purchase a SnapStream Server through our new "Switch and Save" program, and we’ll automatically give you a year of maintenance for free (a $1,200 to $3,000 value). Then, once you've installed your new gear, send us a picture of how you and your staff have cleverly dismantled and responsibly disposed of your obsolete systems. * We'll post the images of your handiwork alongside that of others on our Web site. Be as creative as you can, because we'll bestow an additional year of free maintenance upon whoever sends us the best shot. What's more: Because the SnapStream Server can shorten the task of media monitoring to mere seconds, your organization will save additional time and money. Our digital technology lets you and your colleagues record thousands of hours of television to a centralized appliance, and then locate specific clips by topic, using closed captioning for search. You can copy any relevant video to your PC’s hard drive. It’s that quick and easy! So, what are you waiting for? 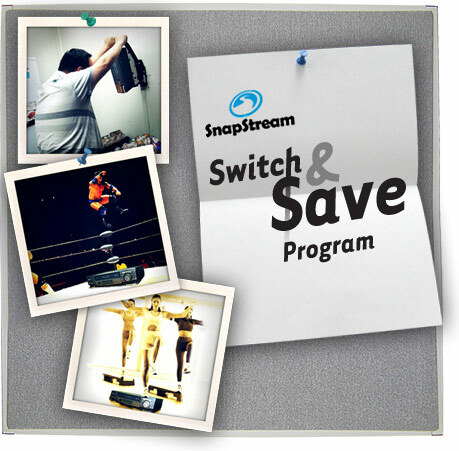 Click here to get more information about "Switch and Save" and the SnapStream Server. *Please recycle. Or ship the parts to us, and we’ll recycle them for you.